I never considered myself a video gamer by any stretch of the imagination, but growing up, I was rather wild for Mario Kart. Unfortunately, while my family had a Nintendo, we didn’t have a copy of that particular game. But I had several friends who owned the N64 version, and we would spend hours in front of the TV playing the Grand Prix mode, slinging banana peels and turtle shells at each other’s characters and trying not to fall off into oblivion, or hot lava, on tight turns. I was almost always Yoshi, unless someone else picked him first, in which case I would begrudgingly choose Princess Peach or Luigi. We often see 3D printing used to create DIY Nintendo systems and accessories, and one Canadian engineer even used a Nintendo controller to power his 3D printer. Obviously, when you think of Nintendo and 3D printing together, Super Mario Bros. comes to mind. But while we’ve seen plenty of 3D printed carnivorous pipes straight out of the original game, there’s not been a lot of love for Mario Kart in the maker community…until now. 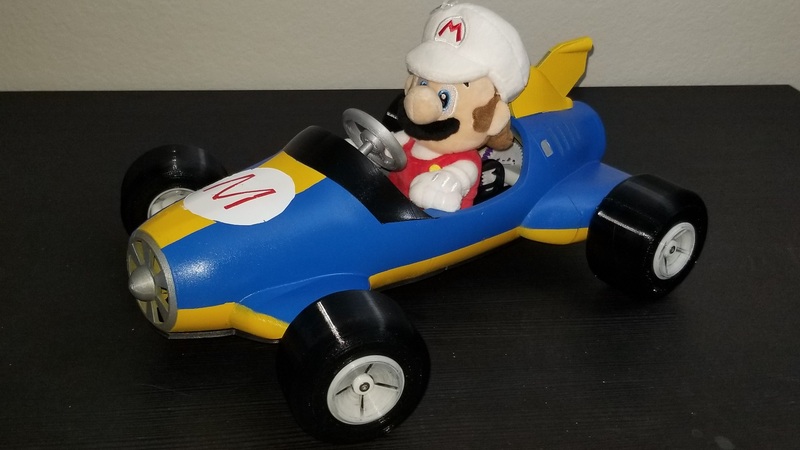 Orlando Rodriguez, a mechanical engineer, maker, and Nintendo fan who goes by Metalurgia’s Designs online, was inspired by Mario Kart to recreate the Mach 8 kart from the game, using 3D printing to turn it into an actual functioning RC car…another item we see often here on 3DPrint.com. Rodriguez, who began the project as a fun way to occupy his time while searching for a job, was also inspired by a specific car from the OpenRC F1 project. 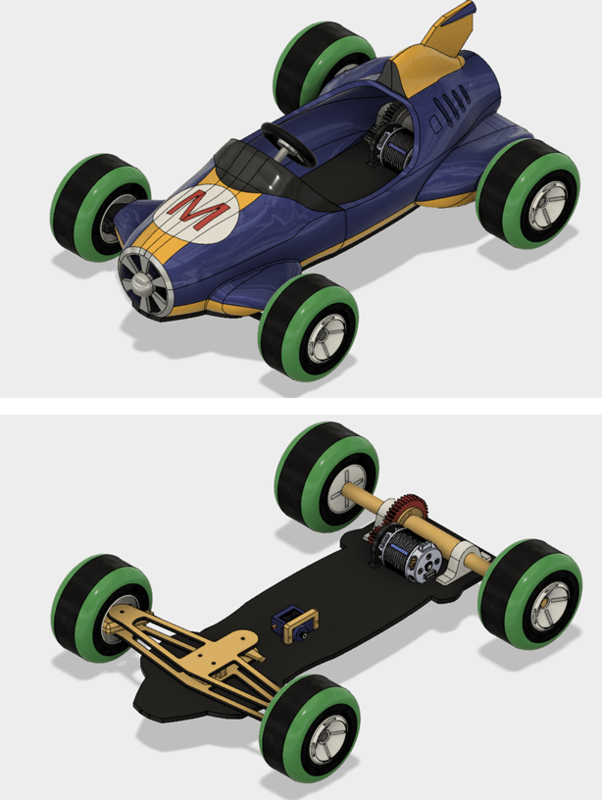 For the shell of his 3D printed RC car, Rodriguez chose the Mach 8 from Mario Kart, and spent two months creating the design with Autodesk Fusion 360. However, things didn’t go swimmingly at first, as the initial design had a weak motor and some clearance issues. 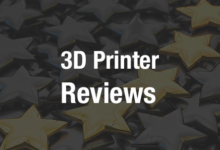 But after an additional two months spent fixing the model and a few other problems, like thin walls and an incorrect gear ratio, Rodriguez was finally ready to 3D print the parts for his functional Mario Kart RC. It took him about a week to 3D print all of the parts, and then he had to sand them after they were removed from the print bed. The primer and paint colors, including paint for the unmistakable Mario ‘M’ on the front of the RC car, came from Rust-Oleum. Rodriguez also said he would be adding a new front axle to the 3D printed RC car, which would use a threaded rod instead of a plastic one. Rodriguez uploaded all of his design files to Thingiverse, where they are free to use if you’re interested in making your own 3D printed Mario Kart car. He also included several wheel options on Thingiverse that were made to work with the Pro-Line M3 tires that he used. However, Rodriguez decided that he wasn’t done with his OpenRC MarioKart Mach 8 Project quite yet, and has been working on an additional kart shell to fit over its existing platform, so keep an eye out on Thingiverse for those files. Do you have any cool 3D printed RC car designs to share? 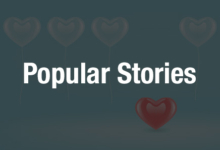 Tell us about them, and discuss this story and other 3D printing topics, at 3DPrintBoard.com or share your thoughts below.